ST JOHN'S WOOD (Jubilee line). 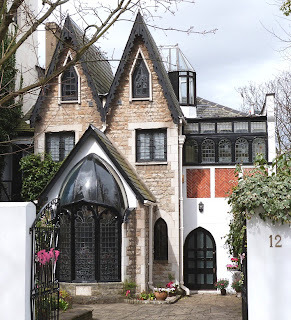 This route will take you to the Abbey Road Zebra Crossing made famous by The Beatles, Lord's Cricket Ground, an interesting graveyard, beautiful church and some quirky buildings. Something for everyone! About 2 miles. As soon as you come out of the station you know you are in a smart area of London because the Tube has its own little garden. To discover what else is unusual, cross to Grove End Road.Turn right down Loudon Road, then left at Langford Place. there is a folly at No. 12. Once a sculptor’s studio, this is a seriously weird building - Darth Vader seems to be embedded in the structure. Next door there is a conservatory with glowing golden stained glass and the painter Dame Laura Knight lived at No. 16. Walk to the end of the road and turn left into Abbey Road. 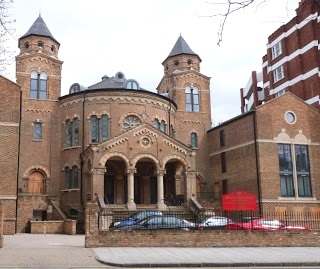 After a few minutes you will see the dramatic late nineteenth-century Romanesque Baptist Church, partly converted to apartments. 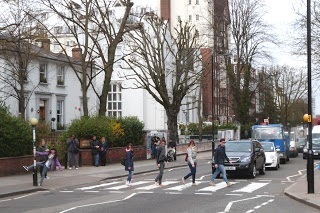 Soon you will come to Abbey Road Studios where The Beatles recorded some of their greatest albums. 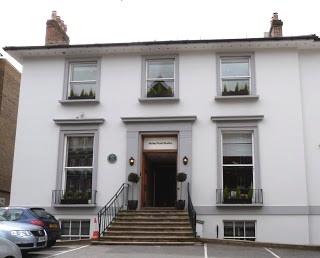 The studio building itself is a nicely-proportioned detached house of the 1830’s, but most people come to look at the low white wall in front where countless Beatles fans have left their names and views on life in general. Sadly, as the wall is so popular, it has to be painted once a month to make way for fresh postings. The famous crossing featured on the cover of the Fab Four's ‘Abbey Road’ album is just beyond the studios and you can spend an entertaining few minutes watching people of all ages doing silly things on the zebra. If you are tempted to join in the fun, just be aware that there is a public webcam in operation! And do spare a thought for local drivers for whom the joke wore thin quite a few years ago . . . When you get to Wellington Place turn right to have a look at Lord's Cricket Ground. This is where most people enter on match days. Although security is tight, you may be able to catch a glimpse of the nets. You certainly can’t miss the Media Centre ‘capsule’ (Future Systems, 1995-8) which looks as if someone has decided to perch an enormous radio set on top of a tall pillar – appropriate, I suppose, but not particularly beautiful. (Incidentally, there are couple of lovely stuccoed houses at the end of Wellington Place, plus, a Penfold pillar box.) If you would like to see a bit more of the cricket ground return to Wellington Road and follow the wall, peering through various gates to have a look behind the scenes. The Marylebone Cricket Club (MCC) was founded in 1787, the modern ground being named after the entrepreneur Thomas Lord, who in 1787 had undertaken to organise the provision of a playing area. 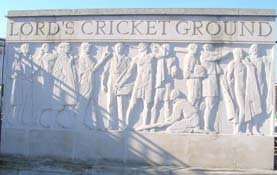 Lord's moved to St. John's Wood in 1814.Cricket fans may want to return to Wellington Road and continue round the corner into St. John's Wood Road to see a lively frieze depicting cricket fans (Gilbert Baye, 1934). Further on are the WG Grace memorial gates (1923). For entertaining early history of Lord's click here (scroll long way down page to fourth image). St. John's Wood Burial Ground, directly across the road from the cricket ground, is worth exploring, as it a little different from the norm. From the entrance in Wellington Place follow the tarmac path past the toilets. Just before the children's play area is the grave of the prophetess Joanna Southcott (1750-1814), (a flat slab set in the grass opposite a memorial stone against the railings). To find the last resting place of the watercolourist John Sell Cotman (1782-1842), pass the playground and go left, then right into a shrubbery with a low wooden fence (there is a sign). Proceed to the end of the graveyard where there is a circular garden on the north side of St. John’s. To get to the church itself, turn left at the Park Road exit. St John's (architect Thomas Hardwick) has a stately classical facade, but, sadly, its dignity is lessened by the fact that the space in front is used as a car park. 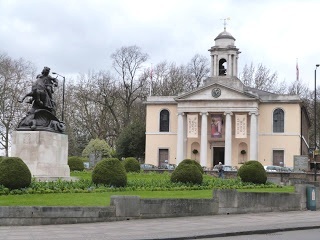 The church and burial ground were completed in 1814, the site having been chosen by the St. Marylebone Vestry (Parish Council) as being ideal for an additional cemetery as it was then in a rural area. On the occasion of the consecration refreshments were available at Thomas Lord's newly opened cricket ground, he being a member of the Vestry. The church is almost always open from 8am to 4-.30pm and is well worth a visit, as the interior is breathtakingly beautiful in its Regency simplicity, with original pastel painted box pews. On an island in the road opposite the chapel is a dramatic statue of St. George and the Dragon, part of the local war memorial. Regent's Park lies beyond. If you would prefer not to walk back to the Tube, there are frequent buses back to central London from Park Road. You will need to use the crossings as you go towards the park, but will be rewarded by a good view of the church and statue from the bus stop. St. John's Wood is just one walk from the many to be found at London Tube Rambles. There are architectural gems, beautiful country views, historic places and quirky buildings to be found in the area covered by the outer London Underground stations. Usually the discoveries are within a mile of the Tube - often only five minutes walk away. If you reached this as an individual page via a search engine, you might like to click on the link above to see the other destinations explored. You'll be amazed at what's out there!